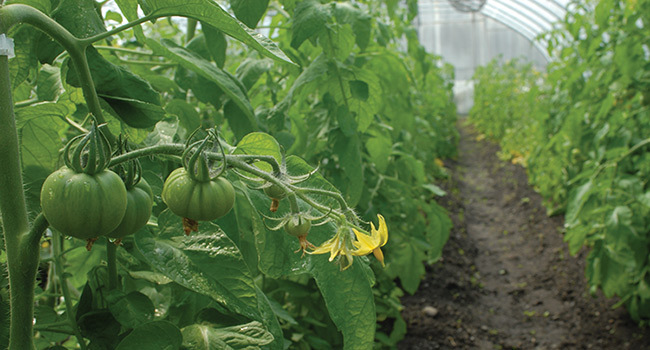 While it's possible to grow virtually any tomato with success in a high tunnel, some perform better than others — primarily because of their particular disease resistances, but also their habit. Here are some recommendations to help you choose varieties that yield well, taste great, and bear up well under conditions and disease pressures common in hoophouses and tunnels. From the greenhouse line-up. 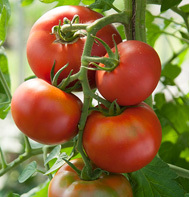 For starters, every single tomato variety in the greenhouse performer line-up is well-suited to high-tunnel growing. And, pretty much all of them will be more reliable than any of the field varieties in the high tunnel because they have strong foliar disease resistance. 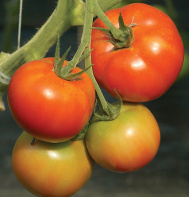 In addition to disease resistance, one of the main goals of a greenhouse tomato breeding program is to develop more "tidy" plant habits — fewer suckers, smaller leaves, more regular growth. Frederik and Sakura are two varieties in which tidiness is very noticeable. Hy-Looms. 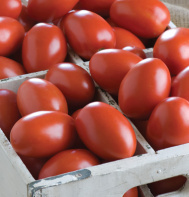 For growers who have trouble with true heirlooms, the French Heritage Tomatoes bear mention. More broadly, this group is worth consideration for anyone who seeks the fine eating qualities but not the limitations and risks inherent in growing heirlooms — which can include lower disease resistance and yield. Favorites from the field. 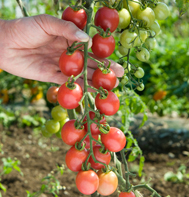 It's equally possible to grow any field tomato in a high tunnel, and in most cases, there are fewer environmental issues in tunnels versus the field. Nonetheless, some are better than others — and again, this is primarily because of particular disease resistances and more compact habits. We've listed our favorites from the field line-up below. But when choosing varieties for high tunnel and hoophouse growing, it's a good idea to be aware of the diseases found in this type of tomato culture. 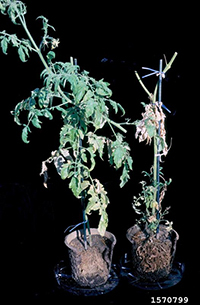 Here is a brief overview of tomato diseases and resistance aspects that rank as important — and why. These are fungi that thrive on the high humidity (85% plus) and restricted air movement that can exist in high tunnels, particularly if they lack adequate ventilation or are left unattended during busy times or under high-risk weather conditions. Leaf Mold (LM) on tomato leaf, top & underside. 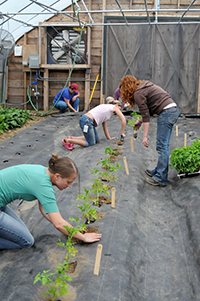 Images courtesy Eric Sideman — Maine Organic Farmers & Gardeners Association (MOFGA). Leaf mold (LM). Fulvia fulva , Passalora fulva. * — A very common, and potentially devastating fungus that causes leaves and blossoms to rot away very rapidly. The spores of the fungus survive in dead plant tissue and other organic material around the high tunnel, and it can be difficult to get rid of them. 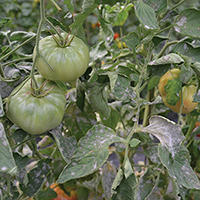 Leaf mold resistance was originally bred into varieties intended for more high-tech greenhouse applications, but many high tunnel growers are finding that they need it, too. * Note: The causal agent of leaf mold is the fungus Fulvia fulva, formerly called Cladosporium fulvum; as of 2013, mycologists also use the name Passalora fulva. Another common name is brown leaf mold. Leaf mold is sometimes confused with gray mold, which is caused by a different pathogen (Botrytis cinerea). For more information on leaf mold, see Ivy, A. 2014. Leaf mold on tomatoes. Cornell University Cooperative Extension. For more information on Botrytis blight, see Doubrava, N, et al. 1999. Gray Mold (Botrytis Blight). Clemson University Cooperative Extension. Gray Leaf Spot (L) on tomato leaf. Image courtesy Clemson University — USDA Cooperative Extension Slide Series. Gray leaf spot (L). Stemphylium solani, S. lycopersici. — A foliar disease that thrives at humidity above 85% and temperatures in the mid-60s (17–18°C). Gray leaf spot causes lesions on the leaves that reduce productivity and eventually cause leaf-drop. 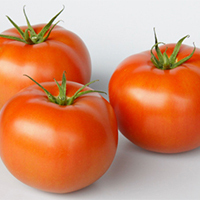 We have found that there are not as many high-quality commercial tomato varieties with grey leaf spot resistance as there are with other resistances. Powdery Mildew (PM) on tomato. Powdery mildew (PM). Oidium spp. — Not found everywhere, but it seems to be on the increase in many regions of the US. Similar impact to gray leaf spot, causing leaf drop, severely reduced yields, and poor quality fruit. There are not many commercial varieties available with PM resistance. 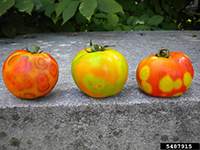 These pathogens multiply over time in areas where tomatoes are grown frequently. Because most farms have limited high tunnel space, and tomatoes are a high-value crop, growers tend to plant tomatoes in the same soil far too often, and disease proliferates. Fusarium Wilt (F) on tomato. Image courtesy Erik Draper, Ohio University — USDA Cooperative Extension Slide Series. Fusarium wilt, Races 0, 1, and 2 (F) [see code chart]. (F. oxysporum f. sp. lycopersici, 3 races) — A fungal disease that lives in soil and enters the plant through young roots. It clogs the vascular system of the plant, preventing water and nutrients from reaching leaves and fruit. 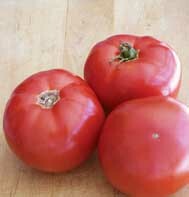 Fusarium resistance is very common in modern hybrid tomatoes. Verticillium Wilt (V) on tomato. Image courtesy Gerald Holmes — California Polytechnic State University . Verticillium wilt (V). Verticillium albo-atrum, V. dahliae — Another fungus that clogs the plumbing of plants, Verticillium enters through small cuts and lesions that may occur on the root surface. 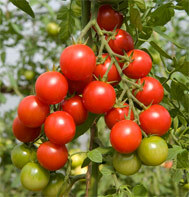 It is also a very common resistance in recent tomato breeding. Southern Root-knot Nematode (N) on tomato. Root-knot nematodes (N). Meloidogyne spp. — Tiny worms that invade the roots of the tomato plants, causing the plant to respond by forming galls or knots in the roots. Knotty roots lose much of their ability to pull in water and nutrients, so the plants become stunted and lack the vigor required to produce marketable yields under stress. These are pathogens that persist in plant tissue or in their insect vectors. 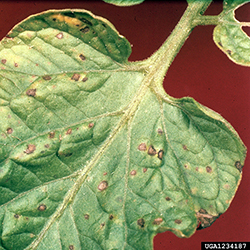 Tobacco Mosaic Virus (TMV). — Symptoms are expressed more strongly in restricted light conditions, such as those that exist under the plastic film and overhead structures of a high tunnel. TMV causes severe stunting and greatly reduced yields, or even death in severe cases. It is easily spread from the hands of people who handle tobacco products, and once infection takes hold, it is spread from plant-to-plant by simple contact. This means that it can move very quickly through a high tunnel, where plants grow close together and workers are touching all of the plants as they prune and harvest. Tomato Mosaic Virus (ToMV) on tomato. Image courtesy University of Georgia, Plant Pathology. 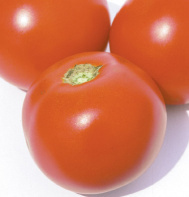 Tomato Mosaic Virus (ToMV). — Very similar in symptoms to TMV, and ToMV is also expressed more strongly under plastic. Growers may have issues with one or the other or both TMV and ToMV, and it is recommended that plant tissue be tested to confirm which one you have, so you can then select appropriate varieties. Tomato Spotted Wilt Virus (TSWV) on tomato. Image courtesy Elizabeth Bush — Virginia Polytechnic. 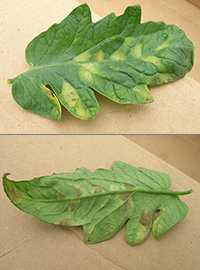 Tomato Spotted Wilt Virus (TSWV). — Spread by thrips, a common high tunnel pest. TSWV causes severe plant stunting and fruit damage. It will destroy a tomato crop. When selecting field varieties for growing in a high tunnel or hoophouse, keep the following factors in mind. Plant Habit. In addition to disease resistance, plant habit is a consideration, and the two are partly related. Plants with extremely vigorous growth are not recommended for protected culture. They become overcrowded, enhancing the stifling conditions that promote foliar disease development. They also require a lot more labor for pruning and trellising, and can be difficult to harvest. 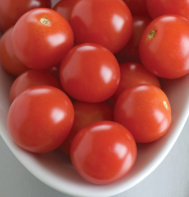 Rangy growth is a trait common in cherry tomatoes, which is why only a select few perform well in the protected setting. Field preferences and performance? It's generally a good practice for growers to have familiarity with how a variety likes to grow outside before scaling up with it indoors. Grafting combinations. And for those who are grafting plants, it is important to know how a particular top variety interacts with a particular rootstock before growing that combination in a tunnel. Some top varieties can become very unruly when grafted, especially to a more vegetative rootstock like Maxifort. RECOMMENDED VARIETIES. Of varieties regarded as field tomatoes, here is the subset that in our experience offer above-average high-tunnel performance. Big Beef — Widely known for its unmatched productivity, and flavor that surpasses most other hybrid beefsteaks. Exceptional vigor helps Big Beef thrive under stresses that may occur in the high tunnel, such as sudden spikes in temperature or humidity. One of the few tomatoes we carry that features Gray Leaf Spot (L) resistance. Also has high resistance (HR) to Fusarium races (F). Bolseno — Bred in Italy specifically for low-tech indoor environments. 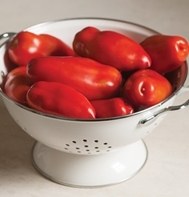 Bolseno was originally added to the JSS catalog as a classic Italian green-shoulder harvest tomato, but growers found that it also produced a fantastic red slicer. We decided to keep it on the merit of its exceptional flavor and performance. HR for F2, ToMV, and V.
Estiva — Beautiful red fruit in a very versatile, 6–7-ounce size. Highly productive; Estiva is often compared to Big Beef in terms of performance, but with slightly smaller fruits. HR for F2, TMV, and V.
Marbonne — Marbonne is a modern hybrid version of Marmande, the most widely revered heirloom tomato in France. Due to their popularity in Europe, there are several similar varieties on the market today. Extensive trialing of different versions has consistently shown Marbonne to be the most flavorful and productive Marmande type available. 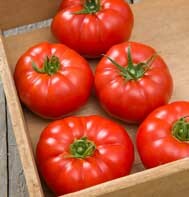 An excellent choice for heirloom look and flavor with F and ToMV resistance. Arbason — Very high-yielding organic option for high tunnels. Arbason has outyielded many of the industry-leading beefsteaks in multiple published university trials. 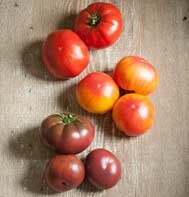 BHN 589 — Hands down, BHN 589 is the best determinate tomato for the hoophouse. HR to TMV, F2, and V, very productive, and with high-quality fruit. Charger — Has some resistance to gray leaf spot, as well as HR for F3 and V. Bred more for Southern growers, Charger also has resistance to Tomato Yellow Leaf Curl Virus (TYLCV), a devastating hot-climate virus that infects both outdoors and in tunnels. Sunpeach — Pink cherry with high resistance to Leaf Mold (LM) and ToMV. Sunpeach has a wonderful low-acid flavor profile typical of pink tomatoes, and rounds out a mixed cherry assortment perfectly. BHN 968 — Determinate red cherry with strong disease package for protected/indoor growing (HR: F, N, TMN, V). BHN 968 also has excellent flavor, and better texture than most determinate cherries. 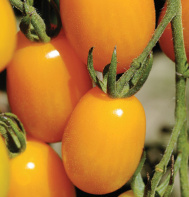 Golden Sweet — Indeterminate yellow grape tomato with high resistance to Leaf Mold (LM) and Fusarium race 1 (F). Golden Sweet fruit is richly pigmented, mild and flavorful. 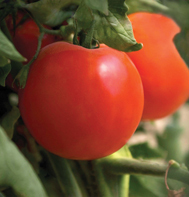 Tiren — An early, classic San Marzano-type bred in Italy to thrive in high tunnel applications. Tiren has no foliar disease resistance, but HR for F, ToMV, and V.
Granadero — Highly productive, organic Roma plum-type. Granadero is one of the few varieties available with high resistance to Powdery Mildew (PM). Also has HR for F2, TMV, and V, as well as intermediate resistance (IR) for N.
Tiren and Granadero both have nice, compact plant habits that work well in the hoophouse. By providing protection from the elements and maintaining warmer temperatures, high tunnels and hoophouses allow the grower to produce quality fruit at earlier and later harvest dates. At the same time, conditions and disease pressures in tunnels can pose challenges to a tomato crop's success. 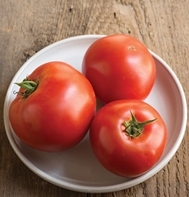 All the tomatoes we've listed here are good choices — not only due to their growing habit and disease resistances, but also excellent yield, appearance, and flavor. Give us a call if you need additional guidance in choosing the best varieties for your particular region and growing methods. Note: Image copyright as noted. All rights reserved.